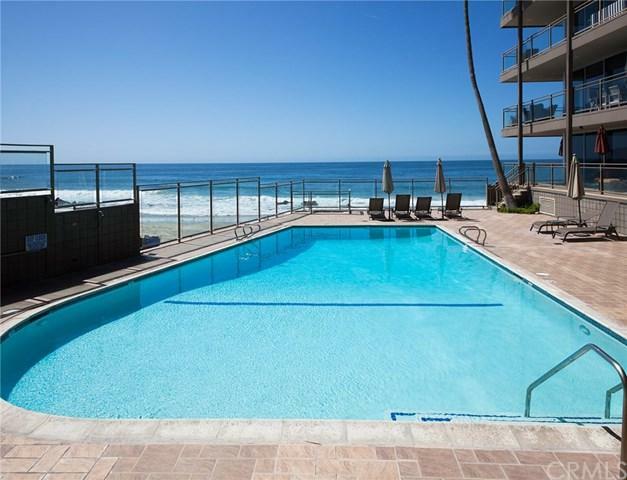 Laguna Sands ocean front condominium overlooking the surf and sandy beach. Single level, ground floor end unit. Just steps to the beach gate access and resort style pool. Enjoy sunsets from your ocean view deck, living room, kitchen and 3rd bedroom/Office. The living room features a wall of glass sliders providing a window to the sea. The living area has space for dining and open to the kitchen with stainless steel appliances and Quartz countertops. 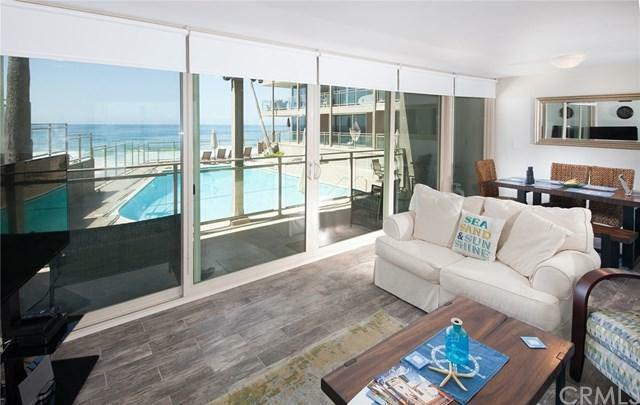 The master suite is spacious with multiple sliding close Laguna Sands ocean front condominium overlooking the surf and sandy beach. Single level, ground floor end unit. Just steps to the beach gate access and resort style pool. 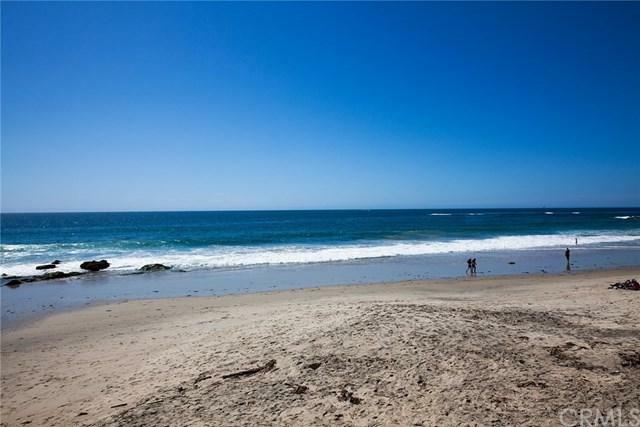 Enjoy sunsets from your ocean view deck, living room, kitchen and 3rd bedroom/Office. The living room features a wall of glass sliders providing a window to the sea. The living area has space for dining and open to the kitchen with stainless steel appliances and Quartz countertops. The master suite is spacious with multiple sliding closets, room for sitting area and connected dual vanity bath. 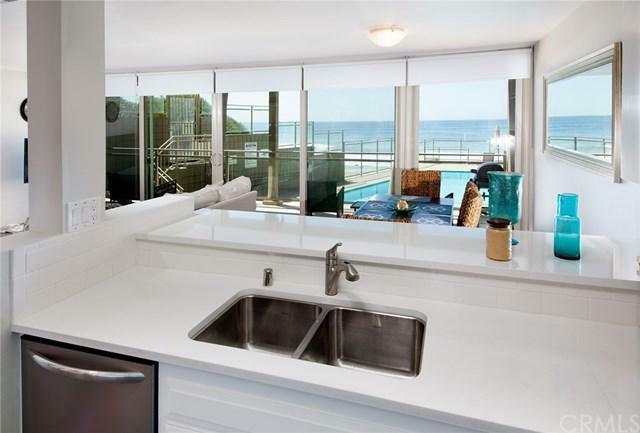 Light and bright white coastal style bathrooms feature dual Quartz vanities and tiled showers. Additional amenities include dual paned vinyl sliders and windows throughout with custom roller shades, plantation shutters. Inside laundry and dedicated water heater. Two gated garage parking spaces are included with this condo and are not tandem, plus guest parking available. The gated parking garage is just steps from the front door. Laguna Sands features a wonderful roof top community deck and central pool for enjoyment. No road noise from PCH, as the condo is sheltered from the parking garage behind it. Outside your door are restaurants, shops and all the best of Laguna Beach. Live the vacation experience of resort, ocean front living every day. Listing provided courtesy of Surterre Properties. Listing information © 2019 San Diego MLS, Inc.